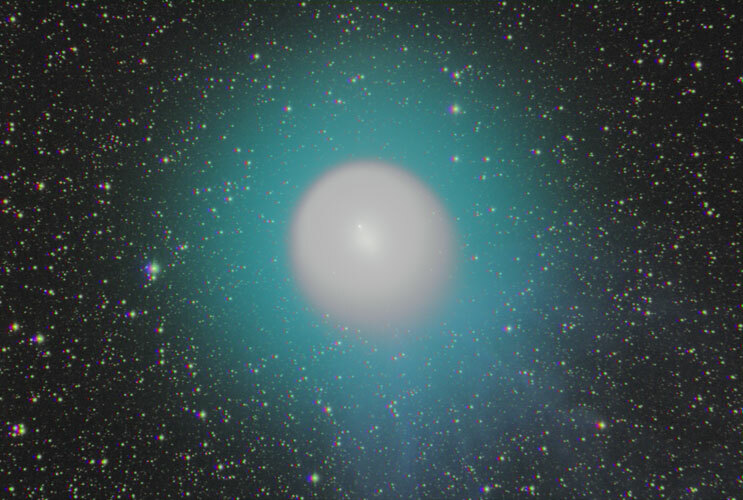 Comet 17P/Holmes was discovered by Edwin Holmes, a British amateur astronomer, in 1892. Its elliptical orbit carries it between the orbits of Mars and Jupiter. Between October 23 and 24, 2007, it suddenly brightened from magnitude 17 to magnitude 2.5, as its nucleus produced huge amounts of dust that became sunlit. Over the course of the next two weeks it increased in size until its shape could be detected with the naked eye. In this image the bright central coma consists of dust being emitted by the nucleus, which is visible to the upper left of the center of the coma. The green halo is created by fluorescing gas. A faint bluish tail is visible in the lower right portion of the image. This image covers an area of 51 x 77 arcminutes. Technical Notes: Individual exposures were taken with the mount tracking on the comet. The individual exposures for each channel were aligned on the nucleus using the Align Centroids feature in CCDSoft and then median combined. The motion of comet accounts for the different positions of the background stars in each channel. The RGB image was created in Photoshop CS2. A Gaussian Blur of 1 pixel was applied to the RGB image. The RGB image was duplicated and then combined with the original using Soft Light to enhance color.